I am interested in mobile robot autonomy. One of the first problems encountered when robots operate outside controlled factory and research environments is the need to perceive their surroundings. My research focuses on efficient inference at the connection of linear algebra and probabilistic graphical models for 3D mapping and localization. I have previously been a Research Scientist and a Postdoctoral Associate at the Massachusetts Institute of Technology (MIT), in John Leonard's Marine Robotics Lab. In 2008 I have received my PhD in Computer Science from the Georgia Institute of Technology, advised by Frank Dellaert. Oct 2018: Jerry's paper on information sparsification in visual-inertial odometry was nominated for the best conference paper at IROS 2018. Oct 2018: We have presented 4 papers at IROS 2018 in Madrid, Spain: Virtual occupancy grid maps, multi-beam sonar processing, information sparsification in visual-inertial odometry, and lidar-camera calibration. Sep 2018: I gave an RI seminar on factor graphs in robot perception. Aug 2018: I am Associate Editor for ICRA 2019. May 2018: We have presented 3 papers at ICRA 2018: Dense planar-inertial SLAM with structural constraints, feature-based SLAM for imaging sonar, and pose-graph SLAM using forward looking sonar (also in RA-L). Jan 2018: This Spring I will again teach Robot Localization and Mapping (16-833). Oct 2017: I am Associate Editor for ICRA 2018. Sep 2017: Andrew Calway, Srikumar Ramalingam and I organized the IROS 2017 workshop on Lines, Planes and Manhattan Models for 3-D Mapping. Speaker slides are now available. Sep 2017: Our GravityFusion work appeared at IROS 2017 in Vancouver. Aug 2017: Frank Dellaert and I published our Foundation & Trends article on factor graphs in robotics. 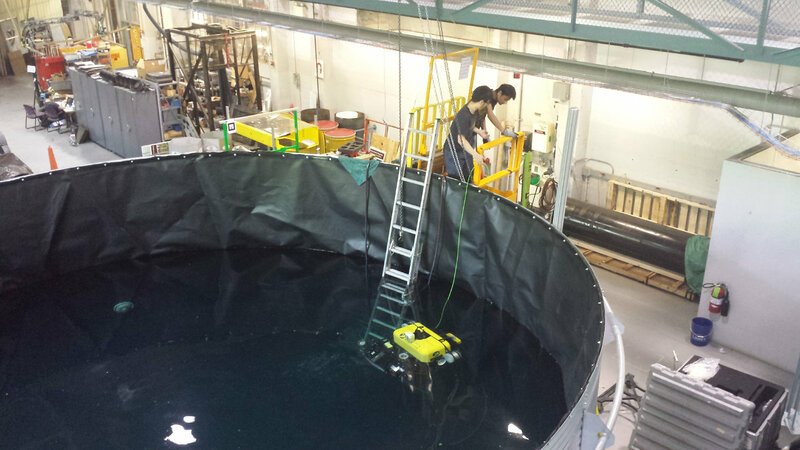 Jul 2017: First robot testing in our new test tank. May 2017: We have presented 4 publications at ICRA 2017: keyframe-based dense planar SLAM, state estimation with touch, stereo matching with normal prediction, and direct visual odometry with binary descriptors (also in RA-L). Jan 2017: This Spring I will teach a new class: Robot Localization and Mapping (16-833). Oct 2016: We have presented 5 publications at IROS 2016: GPS-denied long distance flight, inference with multimodal posteriors, data association for ASFM, underwater mapping, and monocular planar mapping. Sep 2016: I am Associate Editor for ICRA 2017. Jun 2016: I will again co-teach Statistical Techniques in Robotics with Kris Kitani. May 2016: Matt Klingensmith's ARM-SLAM RA-L paper was nominated for the best vision paper at ICRA 2016. May 2016: At ICRA 2016, I gave invited talks at the SLAM tutorial and the marine localization and navigation workshop. Jan 2016: We have two upcoming papers at ICRA 2016: On Degeneracy of Optimization-based State Estimation and Articulated Robot Motion for Simulteaneous Localization and Mapping. Aug 2015: We have two upcoming papers at IROS 2015: Towards Acoustic Structure from Motion and Bridging Text Spotting and SLAM with Junction Features. Jul 2015: I am co-teaching Statistical Techniques in Robotics (Fall 2015) with Kris Kitani. Apr 2015: I am Associate Editor for IROS 2015, which will be held in Hamburg, Germany. Feb 2015: I am now Associate Editor for IEEE Transactions on Robotics. Jan 2015: We have two upcoming publications in ICRA 2015: Mapping with Infinite Planes and 3D Mosaics from Imaging Sonar. Dec 2014: Our "Kintinuous" journal paper has been accepted to IJRR: Real-time large-scale dense RGB-D SLAM with volumetric fusion. Oct 2014: I am Associate Editor for ICRA 2015, which will be held in Seattle. Sep 2014: We have tested our in-water ship inspection robot on the NS Savannah, the first nuclear powered passenger and cargo ship, and a national historic landmark. Aug 2014: I received a Google Faculty Research Award. Jun 2014: I have organized a Visual SLAM tutorial at CVPR 2014 together with Frank Dellaert. May 2014: Upcoming paper on depth enhanced monocular odometry with Ji Zhang and Sanjiv Singh at IROS 2014. Apr 2014: Journal paper with David Rosen and John Leonard accepted to TRO: RISE: An Incremental Trust-Region Method for Robust Online Sparse Least-Squares Estimation. Mar 2014: Our journal paper on Concurrent Filtering and Smoothing has been accepted to IJRR. Jan 2014: I have two upcoming papers in ICRA 2014: on visual-inertial navigation with Paul Huang and John Leonard, and on incremental segmentation with Ross Finman, Tom Whelan, and John Leonard. Nov 2013: Starting at Carnegie Mellon University. “Information Sparsification in Visual-Inertial Odometry” by J. Hsiung, M. Hsiao, E. Westman, R. Valencia, and M. Kaess. In IEEE/RSJ Intl. Conf. on Intelligent Robots and Systems, IROS, (Madrid, Spain), Oct. 2018. Best conference paper finalist (one of six).Details. Download: PDF. “Factor Graphs for Robot Perception” by F. Dellaert and M. Kaess. Foundations and Trends in Robotics, vol. 6, no. 1-2, Aug. 2017, pp. 1-139. Details. “Articulated Robot Motion for Simultaneous Localization and Mapping (ARM-SLAM)” by M. Klingensmith, S. Srinivasa, and M. Kaess. IEEE Robotics and Automation Letters (RA-L), 2016. Part of ICRA/RA-L: presented at ICRA 2016 and published in RA-L. Best vision paper finalist (one of five). Details. Download: PDF. “Real-time Large Scale Dense RGB-D SLAM with Volumetric Fusion” by T. Whelan, M. Kaess, H. Johannsson, M.F. Fallon, J.J. Leonard, and J.B. McDonald. Intl. J. of Robotics Research, IJRR, vol. 34, no. 4-5, Apr. 2015, pp. 598-626. Details. Download: PDF. “RISE: An Incremental Trust-Region Method for Robust Online Sparse Least-Squares Estimation” by D.M. Rosen, M. Kaess, and J.J. Leonard. IEEE Trans. on Robotics, TRO, vol. 30, no. 5, Oct. 2014, pp. 1091-1108. Details. Download: PDF. “Temporally Scalable Visual SLAM using a Reduced Pose Graph” by H. Johannsson, M. Kaess, M.F. Fallon, and J.J. Leonard. In IEEE Intl. Conf. on Robotics and Automation, ICRA, (Karlsruhe, Germany), May 2013. Best student paper finalist (one of five). Details. Download: PDF. “Advanced Perception, Navigation and Planning for Autonomous In-Water Ship Hull Inspection” by F.S. Hover, R.M. Eustice, A. Kim, B.J. Englot, H. Johannsson, M. Kaess, and J.J. Leonard. Intl. J. of Robotics Research, IJRR, vol. 31, no. 12, Oct. 2012, pp. 1445-1464. Details. Download: PDF. “iSAM2: Incremental Smoothing and Mapping Using the Bayes Tree” by M. Kaess, H. Johannsson, R. Roberts, V. Ila, J.J. Leonard, and F. Dellaert. Intl. 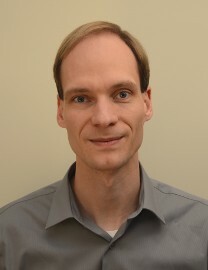 J. of Robotics Research, IJRR, vol. 31, Feb. 2012, pp. 217-236. Details. Download: PDF. “Multiple Relative Pose Graphs for Robust Cooperative Mapping” by B. Kim, M. Kaess, L. Fletcher, J.J. Leonard, A. Bachrach, N. Roy, and S. Teller. In IEEE Intl. Conf. on Robotics and Automation, ICRA, (Anchorage, Alaska), May 2010, pp. 3185-3192. Details. Download: PDF. “Covariance Recovery from a Square Root Information Matrix for Data Association” by M. Kaess and F. Dellaert. Journal of Robotics and Autonomous Systems, vol. 57, Dec. 2009, pp. 1198-1210. Details. Download: PDF. “iSAM: Incremental Smoothing and Mapping” by M. Kaess, A. Ranganathan, and F. Dellaert. IEEE Trans. on Robotics, vol. 24, no. 6, Dec. 2008, pp. 1365-1378. Details. Download: PDF. “Square Root SAM: Simultaneous Localization and Mapping via Square Root Information Smoothing” by F. Dellaert and M. Kaess. Intl. J. of Robotics Research, vol. 25, no. 12, Dec. 2006, pp. 1181-1204. Details. Download: PDF.